Curving walls, fluted columns and golden touches are among features that Californian firm MBH Architects added to an old TV studio in Los Angeles, while converting it into a gym for luxury fitness brand Equinox. Equinox's new location is situated on Miracle Mile – a strip along Wilshire Boulevard that is home to many of LA's biggest arts institutions, like The Los Angeles County Museum of Art (LACMA) and The Petersen Automotive Museum. MBH Architects overhauled a 27,621-square-foot (2,566-square-metre) building that was completed in 1986, and formerly used as a television studio and office. 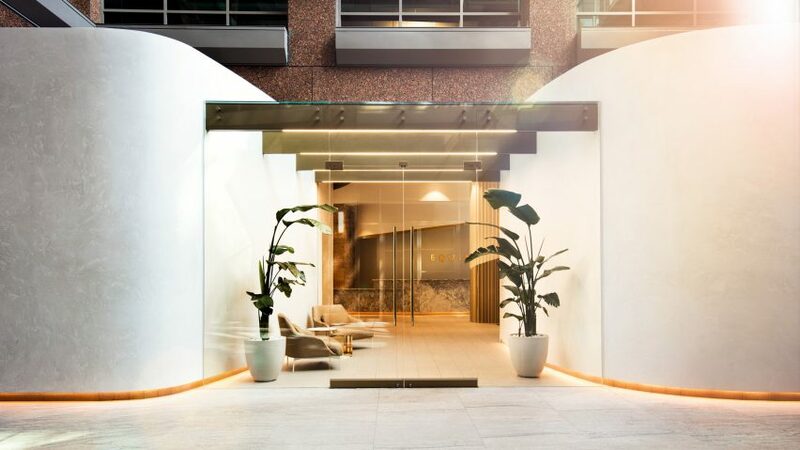 The firm created spaces for pilates, cycling, group fitness, and hot yoga, and also included rooms for spa treatments, a juice bar, a retail space and a children's play area. The decorative features of Equinox Miracle Mile were chosen to stand out from the brand's other nine hubs in the city, while also addressing the challenges of the building's unusual "zig-zag" layout and its poor natural lighting. The spaces are arranged around a multi-storey glazed atrium with curving walls, which are fitted with artificial lighting at the base. "Sweeping curves formed by walls and ceilings with integrated lighting design provide natural wayfinding elements, leading members to the heart of the club," said MBH Architects in a statement. Two curving, pale-rendered walls front the building, with lighting set into indents at the base to provide a golden glow. A glazed volume topped with gold-hued beams slots in between to form the gym's waiting area, which is furnished with a pair of chairs and plants. "A continuous curve was integrated as the main thread in the club, which emerges from the toe lights at the atrium entry, slides into the portal, ascends to the ceiling, and extends to the back of the club," said the studio. Glass doors open from the entrance hall into the reception area, where the first of several large fluted columns is found. Cast in gypsum reinforced with glass fibre, the columns includes shallow grooves and have a golden finish on the lower portion. MBH Architects intended these columns to be "an interesting focal point, encouraging people to touch and experience the subtlety of its surface texture". Equinox's logo is mounted on the wall behind the marbled reception desk, which also features lighting underneath. Above, a curved opening reveals a gold lining that becomes a ceiling feature as it wraps around the top of the group fitness studio. Another similar design is found above the shoe cubby at the entrance to the changing rooms. Golden brick-like tiles line some the walls in these areas, while others surfaces are covered with pale tiling. A yoga studio adjoining the entrance to the dressing room is fronted with a two-way mirror, providing privacy for those exercising. Inside, the walls are black to offer a contrast the other areas inside the gym, which are predominently painted white and pale grey. Equinox was established in New York in 1991 as a subsidiary of major American developer The Related Company. In addition to Los Angeles amd New York, it has gyms across major cities like London, Toronto, and Vancouver. Along with luxury fitness centres, the brand is also opening a chain of hotels. One of the first will be located at Frank Gehry's The Grand mixed-use development in Downtown LA, while another is planned for New York's Hudson Yards. Photography is by Jason Madara.